One of our customers planned a super spectacular party for her little super hero's 5th birthday. This invitation from Picture Perfect is just the right start to a party like this. You could include small masks with each invitation to get the guests excited about their own super hero costume for the party. She kept it simple with decorations by using the colors red, blue and yellow in balloons and a flag banner. (By not focusing on one particular super hero, it made it easy to incorporate all of the children's ideas about a super hero.) Galvanized buckets filled with red and blue colored tootsie pops centered each table and the birthday boy's cake incorporated four different super hero emblems in the corners. With an afternoon party from 2 to 4, she was able to keep the refreshments light. Crazy straws in cups filled with Sprite and colored ice cubes (made out of colored juice) gave the guests their super powers! Cat-woman claws (Bugles), chips and dip, and fruit rounded out the rest of the fare. The birthday boy crossing the "Lava Pit"
When guests arrived to the party, they received a brown bag that had been painted with a simple crest and their initial. Inside was a "Super Hero Training Academy" card, a can of silly string, a t-shirt for creating their own super hero symbol, a ring pop, and an energy (granola) bar. The kids began with making their t-shirt. They were able to sponge paint their initial on the t-shirt which had been pre-painted with a small crest-emblem. Then, they began the Training Academy, which was filled with different stations in the back yard. The children used silly string to "Vaporize a Villain" by spraying it on the faces of villains which had been taped to balloons. Another station had the children "Capturing Kryptonite" by finding special green spray-painted rocks that had been hidden around the yard. The big hit of the party was having the kids "Cross the Lava Pit". The Lava Pit was an inflatable pool that had been lightly filled with water and a red bath tablet. The pool was flanked with cinder blocks on which rested a wooden plank. Inside the pool and under the wooden plank was a small bucket filled with dry ice and hot water. The kids loved it! The structure of the stations kept the children engaged and kept all that super energy in check. At the end of the party, each child received a certificate stating they had graduated from Super Hero Academy with their own made-up Super Hero name on it. The party was a huge success and everyone was happy, especially our customer. She felt like the stations were easy to set-up and there wasn't much prep work. In fact, the super hero birthday boy was able to help with most of the preparations. 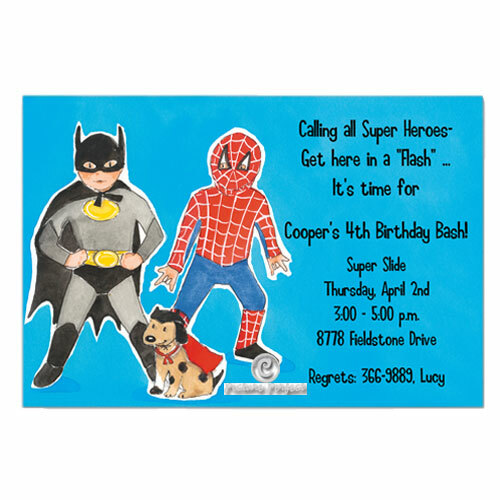 See more Super Hero party ideas on our blog here!